Friends of Santa Cruz State Parks will host its annual ParkStore Holiday Sale Friday, Nov. 30, to Sunday, Dec. 2, at four ParkStore locations at state parks and beaches in Santa Cruz and Aptos. Proceeds from the Holiday Sale benefit local state parks and beaches. The Holiday Sale begins with a preview event at Natural Bridges State Beach from 4-7 p.m. Friday, Nov. 30. Become a member of Friends of Santa Cruz State Parks and receive additional discounts. 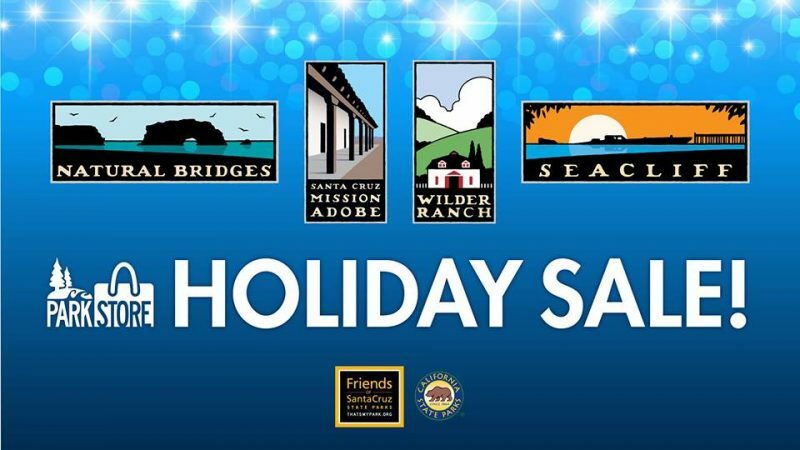 The sale will continue Saturday and Sunday, Dec. 1-2, at Natural Bridges as well as Santa Cruz Mission State Historic Park, Wilder Ranch State Park and Seacliff State Beach. Sale hours are 10 a.m. to 4 p.m. both Saturday and Sunday. The Holiday Sale offers a 20 percent discount (30 percent for Friends members) on park-themed merchandise, including apparel, jewelry, books, toys and select iconic Michael Schwab art. A variety of products, including hats, pins, stickers and key chains by popular artist Tim Ward, Socksmith socks, nature-related books, silk scarfs and jewelry will also be available for purchase. During the sale, customers may become members of Friends for $50 to receive the 30 percent discount. Established in 1976, Friends of Santa Cruz State Parks is an entrepreneurial nonprofit sustaining the legacy of our state parks and beaches. Through an innovative partnership with California State Parks, and by leveraging local community support, Friends provides funding for educational programs, visitor services and capital projects. Friends is passionately dedicated to the preservation of our spectacular natural environment and rich cultural history. Friends also operates six ParkStores, offering nature- and history-themed merchandise for sale to benefit local parks and beaches. ParkStore locations include Natural Bridges, New Brighton, Santa Cruz Mission, Seacliff, Wilder Ranch and Online. Learn more at ThatsMyPark.org or via Facebook, Instagram, Twitter, YouTube and Pinterest.